This book introduces a new core class to your d20 System fantasy campaign, the RuneMark. These magi strive to master the Language of Creation, that magic that formed and binds the world. Intelligent and wise, the RuneMark devote themselves to mastery of the Book of Winter Runes, forty-five new spells (levels 1-9) to add to your game. Also included is the runic alphabet for the spells, and the mythology of the Rune Lords. The first part of the pantheon details four new deities, including their domains and spells, and twenty-four demigods. 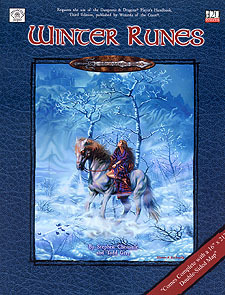 "Of the Horned God's Winter"
This adventure introduces the RuneMark into the DM's campaign. Brave heroes must journey through the wastelands, over dark fens and broken hills to the iron foundations of the great fortress of Varucks, a heap of burnt slag and tortured rock. In the land of dark shadow and forgotten dream they must unravel the secrets of the horned god's minions and master the Winter Runes. This adventure further details the epic story of the World of Erde, yet easily adapts to any setting.